The private sector is much better suited to combatting non-communicable diseases. Did you know that roughly 90% of pediatric cancers are curable? In the United States, approximately 1,200 expected deaths are expected to occur annually from around 10,000 new cases of pediatric cancer. However, in low-income countries, the survival rate can be as low as 5%. Information from the UN's Sustainable Development Goal 3. Governments in many emerging and frontier markets have put millions of dollars to work in addressing public health issues, and “Good health and wellbeing” represents the third Sustainable Development Goal on the UN’s global agenda. A combination of governments, non-profit organizations and private-sector players have led in recent years to reduced child mortality, improved maternal health and a decrease in HIV/AIDS. According to the United Nations, preventable child deaths have fallen by over 50% and maternal mortality by 45% worldwide since 1990. New HIV/AIDS infections fell by 30% between 2000 and 2013, and over 6.2 million lives were saved from malaria. The numbers are staggering, yet infectious diseases are not the biggest cause of death in the world. Macro trends in emerging and frontier markets have led to an increase in the incidence and mortality of non-communicable diseases (NCDs). People are living longer, in part due to the strides made in the fight against infectious diseases, and increased healthcare access for those in rural areas. Lifestyles are increasingly sedentary, as populations cluster in urban areas and communities shift from agriculture-based lifestyles to metropolitan ways of life. Diets are becoming more meat-based and westernized. All of these factors have led to an increase in the incidence and mortality of NCDs. The top 10 causes of death globally in 2016. NCDs – including cardiac diseases, cancers, chronic respiratory diseases and diabetes – represent 63% of all annual deaths. They are among the top killers in developed countries, and their effect on developing countries is beginning to show. 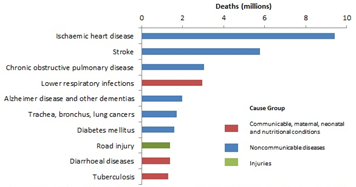 Unlike infectious diseases, however, NCDs are often chronic diseases with no one-time solution. Treatment of these diseases have not historically been adaptable to non-profit aid models, which prefer tangible outcomes tied to dollars invested. Rather, efforts to combat them are much better suited to private-sector solutions, where long-term sustainability and viability of a model must be proven. Private-sector players have been investing in health systems in these markets for decades. Key players include development finance institutions (such as the International Finance Corporation, the Commonwealth Development Corporation and the African Development Bank), private investors (including Columbia Pacific Management and the Tata Trust) and private equity (like the Abraaj Group, Alta Semper, the Investment Fund for Health in Africa and LeapFrog Investments). Emerging market investment in private healthcare, 2008-1H 2016. Most private-equity funds centred on healthcare in emerging markets focus on investment opportunities in infrastructure (hospitals, laboratories, clinics, pharmacies), technologies or medicines. Often, private investors can support innovative healthcare businesses with the potential to scale by providing strategic or operational value to improve competitiveness. In the infrastructure space, private investors are increasingly turning to diagnosis and treatment of NCDs due to the high capital expenditure needed to create these facilities. Limited competition exists due to the government’s capital constraints and the non-profit sector’s preference for aiding infectious diseases. The chronic nature of the diseases means that patients are often seeking treatment on a continual basis. Limited competition and recurring treatment cycles lays the groundwork for a good investment. To complement this, technology platforms providing innovative solutions are beginning to scale. Telemedicine, often utilized by private equity-backed facilities, offers different models of diagnostics, expertise and education to fit the needs of low-resource environments. Healthcare data digitization provides cost-efficient solutions for hospital information systems, better hospital management and increased profitability for healthcare providers. Colposcopes connected to smartphones can now screen for cervical cancer; cheaper DNA sequencing can provide rapid cancer diagnostics; and platforms for crowdfunding patient care are adapting technological advances for low-resource settings. Most recently, Abraaj Group’s $1 billion Global Health Fund was seen as an innovative opportunity for the private sector to address global health needs, and the fund prioritized four categories of NCDs: cardiac diseases, respiratory illnesses, oncology and diabetes. However, Abraaj Group, and its Global Health Fund, collapsed due to lapses in governance. This failure came in the form of the accounting and governance practices of the fund manager rather than the investment strategy failing. What this highly publicized failure highlights is the need to carefully evaluate the governance standards of investments and not be disillusioned by an admirable social mission. Global health issues are ever evolving, and the shift from infectious diseases to NCDs as the world’s biggest killer is just one example. 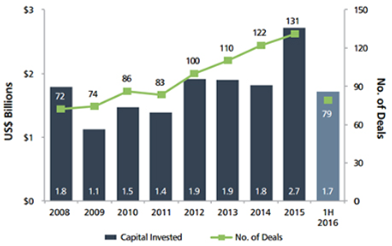 Private-equity investors have long made investments in healthcare companies and facilities in emerging markets in the past and will continue to do so. While the lives saved through the capital provided will be a less laudable number than when treating infectious diseases, many more people will be given the chance to live longer. However, as increasingly lethal and chronic diseases emerge, it will take business, government, civil society and academic leaders to come together in order to properly develop sustainable models of healthcare in emerging and frontier markets.